Accell Clean® Marine and Accell Clean® Marine Plus are unique cleaning products that amplify the ability of surfactants to clean oils and greases from surfaces and, at the same time, accelerate natural biodegradation of residual oils and other hydrocarbons on surfaces and in wash water. Accell Clean® Marine and Accell Clean® Clean Marine Plus are unique cleaning products that amplify the ability of surfactants to clean oils and greases from surfaces and, at the same time, accelerate natural biodegradation of residual oils and other hydrocarbons on surfaces and in wash water. 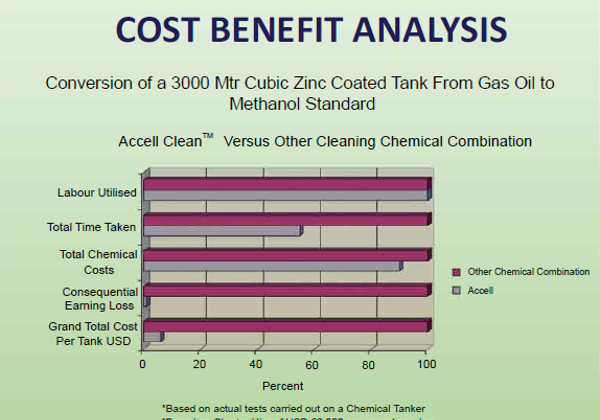 Accell Clean® Marine is a biodegradable, heavy-duty cleaning agent, specifically designed for cleaning zinc silicate coated tanks of Annex II shipboard chemical cargo tankers that transport diesel fuel, methanol, edible vegetables, oils, and a variety of other bulk commodities. 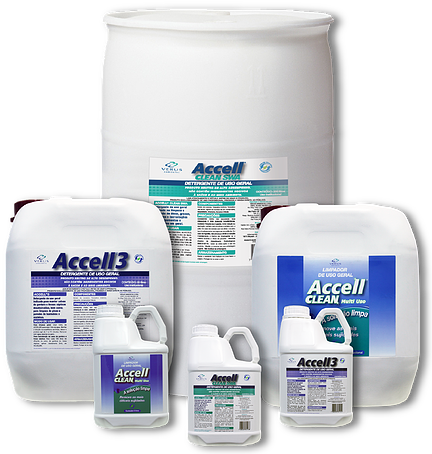 Accell Clean® Marine is highly effective with a neutral pH, making it safe for employees, stainless steel, and epoxy-coated tanks, and the environment. 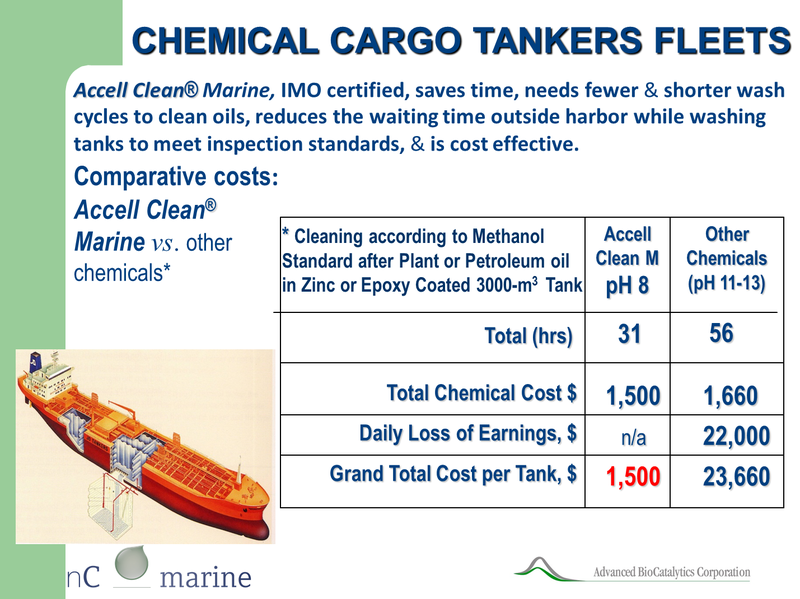 Accell Clean® Marine Plus is a readily biodegradable, more alkaline, heavy-duty cleaning agent, specifically designed for cleaning of Annex II shipboard chemical cargo tanks, when more aggressive alkaline treatment is desirable. 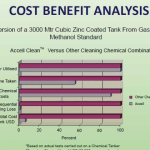 Accell Clean® Marine Plus is not recommended for zinc silicate coated tanks due to its pH. 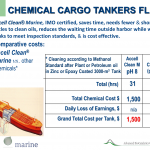 Approved by the International Maritime Organization (IMO) for use as a tank cleaning additive, and listed in Annex 10 of the MEPC.2.Circ. Can be applied manually by brush or hand spray, or alternatively by low/high pressure washing systems. Hot (up to 60°C) and ambient temperature sea or freshwater can be used. Accell Clean® Marine and Accell Clean® Marine Plus should be handled with protective face/eyewear and gloves. Keep container tightly closed until ready for use. Store in cool, well ventilated place that is locked. Accell Clean® Marine and Accell Clean® Marine Plus has a shelf life of 1 year. Guidance on transport in bulk: Transport in bulk according to Annex II of MARPOL 73/78 and the International Bulk Chemical Code (IBC code).